2005 champ Marvin Birnbaum had cold dice as he opposes Dave Denton. Carrie Lewis triumphed over Sean McCulloch for her second trip to the Final Four. A fixture in the Century for more than a decade, March Madness was granted Legacy status in recognition of its past success and continued popularity. At a time when many sports games are feeling the squeeze from both Eurogames and resurgent wargames, it continues to draw well -- in fact, attendance was up about 15% from 2006. There are a number of reasons for this. From the early days of the old Avaloncon, the event has been blessed with dedicated GMs -- beginning with legendary GM John Ellman -- and one of the most eclectic, competitive and quite simply fun groups I've ever had the pleasure of gaming with, year in and year out. The format doesn't hurt, either. It is the quintessential WBC experience: Keep winning, and make the Final Four; lose, and you're out at least until the next regional. This year, we stayed with the successful formula of moving away from pre-generated brackets for each of the four heats, as has been the case for the past few years. Where possible, basketball powers were placed in their traditional regional, but all heats were organized with variety and balance very much in mind. Anyone who pulled an upset was still rewarded by their section of the draw opening up. This system has proved popular, mainly because it gets everyone playing immediately, with very few byes needed. The heats this year played briskly, with two finishing in record time. The first sign that participation might be up this year was that 14 showed up for the first heat, generally one of the lightest in attendance (and perhaps indicative of how many more gamers show up on Tuesday than in prior years). Many of these would-be John Woodens were taken out early, however, including the top-seeded UCLA 73 squad led by Sean McCulloch. The winner of that game, Dave Anderson, took the lowest-seeded team in the regional to the regional finals, besting former champs Terry Coleman and Ken Gutermuth along the way, until falling to defending champ Jeremy Billones' red-hot New Mexico State 1970 team. The Midwest Regional on Wednesday is generally the highest-attended heat, and did not disappoint with a whopping 24 players, including a half-dozen former champions. 2004 winner John Coussis looked early on as if he might repeat former glories, after a 30-point win in the first round. But then he ran into Steve Caler's inspired play with Georgetown 85. Defying the old adage that John Thompson teams couldn't score, Steve played aggressively, and fought his way through one opponent after another, until falling just short against Terry Coleman's Providence 73 team in the regional final. Bruce Reiff opened play in Heat 3 with the top seed, Arkansas 78, a team with a powerful bench -- exactly the type of team Bruce plays better than anyone. But in one of the biggest upsets of the tournament, the event's four-time champ was taken down by Jim Bell. Jim's 1965 UCLA team kept rolling until Carrie Lewis stopped them in the semi-finals in a barnburner, 105-101. In the other bracket, Chris Bauch lost a close game to Marvin Birnbaum in a game where the refs played a huge role: all in all, seven technical fouls were played, with Chris' Louisville team having one in hand when the game ended. Meanwhile, Don Greenwood made a welcome return appearance for the first time in years. Despite a little rust, Don managed to beat both Terry Coleman and former Consul Devin Flawd before falling to a resurgent Sean McCulloch. In the regional finals, however, Sean's defensive Georgetown squad couldn't slow down Carrie Lewis, who returned to the Final Four for the first time in years with a hard-earned 75-69 victory. The final heat brought 16 coaches and a mix of new players (some of whom had just learned the game at the demo earlier in the week) to go with the usual veterans. Two Hall-of-Famers faced off in the second round, and Bruce Reiff's outside shooting was just enough for his NC State 83 team to overcome Ken Gutermuth's Cincy 61 squad. Harry Flawd's reward for beating 2001 champ Dennis Nicholson was that he had to play Terry Coleman's high-flying Loyola-Chicago 63 team in the semis. Although Terry managed to hold off Harry, his team couldn't stop Derek Landel in the regional final. 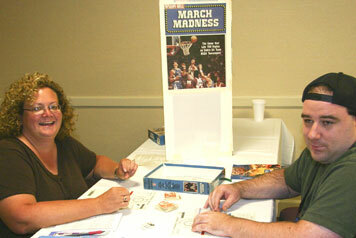 In the Final Four, Derek's North Carolina 97 team looked like an even match with Carrie Lewis' Texas Western 66 squad. Carrie's balance was evident, as she kept getting scoring from unexpected places and had a nine-point lead at halftime. But foul trouble for Carrie and a 52-point explosion in the second half proved just enough for Derek to triumph 89-85, in probably the best game of the tournament. The other Final Four showdown was an exact rematch of last year, with Terry taking on the defending champ, Jeremy -- Terry even gping so far as yo have the same team again. Unfortunately for Terry, the result was the same, as the reigning champ played a box-and-one on Terry's ace scorer in both halves, and Terry's backups never took advantage of the gimmick defense. Jeremy now appeared poised to repeat. However, Derek was not to be denied in the Final. Earlier in the tournament, he had overcome a 20-point deficit to defeat Reiff, and it seemed his team could overcome any obstacle. In a turnabout from the previous game, this time it was Jeremy's top scorer who was slowed down just enough in each half, as Derek won by 11 points. During the first eight years of March Madness events, there were only four different winners. Now, there have been eight different winners in a row, and seven of them have won the title for the first time. This shows both how difficult this title is to win, as well as how much the level of competition has improved overall in the last few years. I offer my congratulations to not only the winner, Derek, and to the other Final Four participants, but to all of the players, who make this my favorite event to run every year. See you next year. GM Bruce Monnin won his second championship in this event, surviving a 38 player field in the fifth annual BPA March Madness PBeM Championship. Monnin's 1983 NC State squad defeated Pete Staab's 1985 St. Johns team 89-84 in the final game, the third five point spread for the Wolfpack in the tournament. Both teams in the Final were the #17 seeds in their respective brackets, proving you do not need to grab one of the top teams in the draft to do well in the tournament. Bruce's 1983 NC State team reached the Final by winning every game by at least five points, and comfortably defeated Harry Flawd's 1981 Indiana squad by 13 in the semi-finals. In the other bracket, Bob Menzel consistently won close games, triumphing by five points in the Sweet Sixteen, three in the Elite Eight and six in the semi-final game over John Coussis' 1966 Kentucky Wildcats. The Final, saw a wild high scoring first half, as both teams posted 49 points. Bruce's Wolfpack had a slight advantage as Pete's Redmen (they did not become the Red Storm until years later) suffered a first half foul on its bench. The second half had many positions resolved quickly. The key resolution was the left forward, as NC State's Thurl Bailey outscored St. Johns Walter Berry. A St. Johns timeout led to a reroll which was also won by Bailey, this time leading to a foul on Berry. The resulting six point advantage held through the duration. Definitely an old school all tournament team, with all five player from 1979 teams or earlier. No members of last year's All Tournament Team repeated this year.